I don’t normally post stuff like this but I love a bargain, especially in the unbearable bleakness of cash-squeezed January and wanted to let you know about a great beauty offer. Luxury beauty specialists SpaceNK have a really good referral promotion running at the moment for new customers. 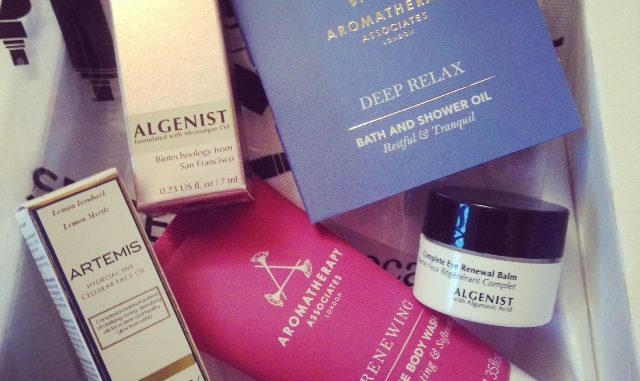 How it works is this – click through on a referral link, use the code provided and you’ll get free delivery plus a goody bag of luxury beauty samples. UPDATE: The goody bag offer has now ended. The current referral offer is £10 off any £40 order, plus free shipping. 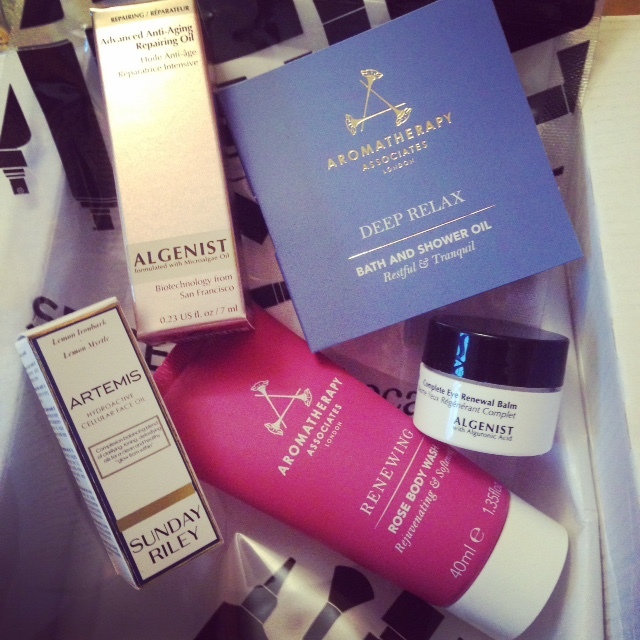 I’m really pleased with it because it’s all decent sized samples of brands I haven’t tried before. Total value = £55.82. The Algenist eye balm alone is worth over £22 as it’s half full size. Sunday Riley is a brand I’ve heard a lot about so it’s great to be able to try out their face oil without having to shell out £60 for the full bottle. You have to be a new customer to the SpaceNK website. This is an online only offer. Minimum order is £20 (though the goody bag is worth a lot more). Order can include sale products, and they currently have lots of sale stuff at up to 70% off. Don’t panic if the goody bag is out of stock, you’ll get it eventually. There are at least two variations of the goody bag so you won’t necessarily get the one shown above. If anything, I think the other one is nicer as it has more make-up and a mini Diptyque candle. Have a rootle around online and you might be able to turn up a pic. I am not being paid to promote this, but I will get a ‘beauty gift’ for every three people I refer. No idea what that might be #excited There is also a top prize of a £150 gift card for whoever refers the most people but I think my chances of getting that are as remote as a Scottish island. So once again, this is the link to redeem the SpaceNK referral offer : http://cob.uy/ae085bo Feel free to share it with anyone you know who might be interested. And this is what I bought in order to qualify for the goody bag. 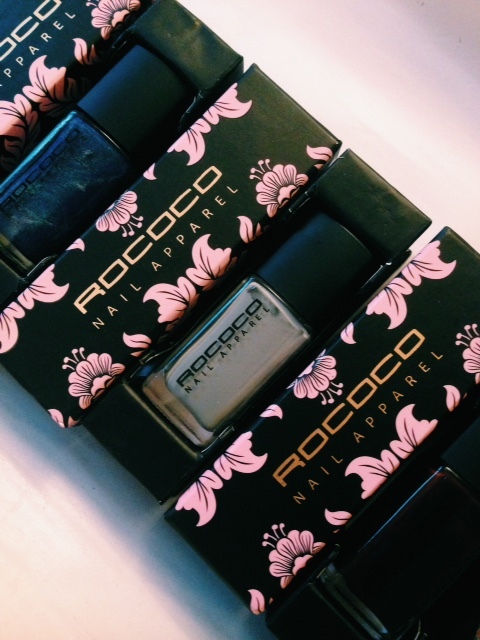 There was no minimum value when I ordered (they added in the £20 threshold on 20th January) so I splashed out a whole £4.50 on three Rococo nail polishes which were reduced from £12 to £1.50 each. Very pleased with them and their tiny polish wardrobes/coffins. This is my treat for doing my tax return. Really, it should be a business expense because nice nails make you type better, don’t they? What do you think?